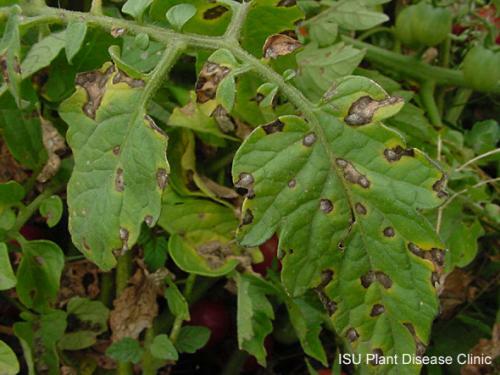 Wet conditions favor the development of fungal blights of tomato. 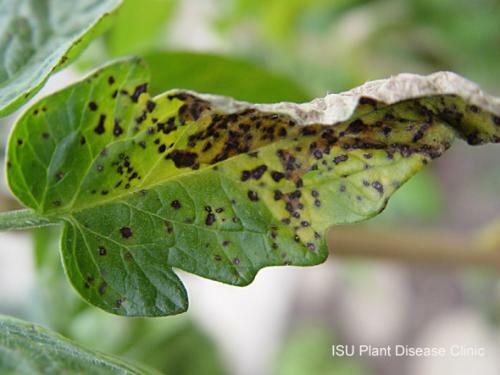 Septoria leaf spot and blight is a common foliage disease of tomato caused by Septoria lycopersici. Symptoms are evident in the foliage, particularly older (lower) leaves. Septoria blight causes numerous small (about 1/8" to 1/4" in diameter) brown spots that develop light tan to white center as they age. The overall effect of both blights is similar. Leaves turn yellow, brown, then wither and die. Septoria blight and early blight both overwinter on infected debris from previous years. If there are only a few plants in a garden, the progress of the blights may be slowed somewhat by removing infected leaves as they appear. Nevertheless, fungicide sprays are likely to be needed if these diseases are present. Many products are labeled, however seldom infective if used alone without other management tactics. Cultural techniques can help to reduce the risk of foliar blight outbreaks, but it takes some advanced planning. At the end of the season, remove as much tomato plant debris as possible from the planting. Till thoroughly in the fall in order to break up remaining infected debris. Rotation away from tomatoes and potatoes for 3 to 4 years also helps to break the debris link in the disease cycle. If a long rotation is not feasible, a 2-4" layer of organic mulch (chopped deciduous tree leaves, grass clippings, straw, etc.) placed over the soil surface after transplanting acts as a barrier against release of fungal spores. Planting density or spacing, as well as sucker pruning and trellising improve air movement and reduce humidity needed for disease development. Reducing overhead watering (to reduce spores splashing from leaf to leaf and from leaf debris) also helps. Improve sanitation in the garden can contribute to reducing the amount of the pathogen present for next year.